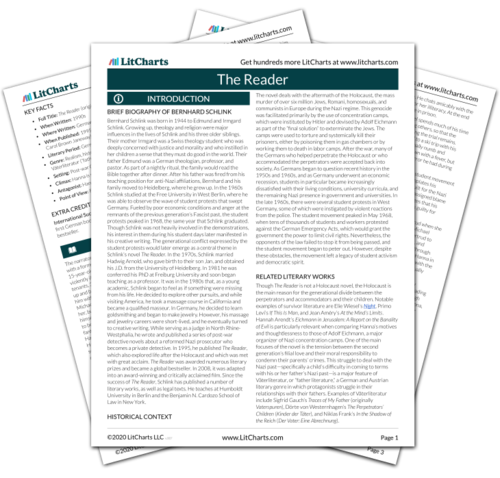 Instant downloads of all 942 LitChart PDFs (including The Reader). The narrator, an older Michael, reflects on the Bahnhofstrasse building, noting that it is eventually torn down and replaced by a crowded five-story apartment building with ever-changing tenants. Michael finds this new building lacking compared to the old one. Whereas the new building has a smooth plaster façade, the old building was more ornate, with brickwork, balconies, and lion statues. As a small child, Michael had been aware of the building, which “dominated the whole row” with its breadth. He had imagined the building’s interior to be elegant and lavish, and that its inhabitants would be “grand” but “somber” people. As the narrator compares the past and present states of the woman’s apartment building, he shows himself to be nostalgic for his past. The dominant position of the building on its street, as well as Michael’s unrealistic childhood fantasies about the building, mirror the dominant role of the woman, whom the building represents (at this point), and the misconceptions he has about her. Later on in his life, Michael had recurring dreams about the building. In the dream, he would be walking on an unfamiliar street in an unfamiliar town, or he would be driving in the countryside, when he spots the building, which he recognizes from a previous dream. He approaches the house, whose windows reveal nothing, and just as he is about to open the door, he wakes up from the dream and realizes he has dreamed it before. When Michael is older, the building haunts him in his dreams, no matter where he is. Like the woman, the building is always in his mind, but simultaneously distant and inscrutable. Lee, Sophia. "The Reader Part 1, Chapter 2." LitCharts. LitCharts LLC, 9 Mar 2017. Web. 18 Apr 2019. Lee, Sophia. "The Reader Part 1, Chapter 2." LitCharts LLC, March 9, 2017. Retrieved April 18, 2019. https://www.litcharts.com/lit/the-reader/part-1-chapter-2.